French musical composer, born on the 11th of December 1803 at Côte-Saint-André, a small town near Grenoble, in the department of Isere. His father, Louis Berlioz, was a physician of repute, and by his desire Hector for some time devoted himself to the study of medicine. At the same time he had music lessons, and, in secret, perused numerous theoretical works on counterpoint and harmony, with little profit it seems, until the hearing and subsequent careful analysis of one of Joseph Haydn's quartets opened a new vista to his unguided aspirations. A similar work written by Berlioz in imitation of Haydn's masterpiece was favorably received by his friends. From Paris, where he had been sent to complete his medical studies, he at last made known to his father the unalterable decision of devoting himself entirely to art, the answer to which confession was the withdrawal of all further pecuniary assistance. In order to support life Berlioz had to accept the humble engagement of a singer in the chorus of the Gymnase theatre. Soon, however, he became reconciled to his father and entered the Conservatoire, where he studied composition under Reicha and Lesueur. His first important composition was an opera called Les Francs-Juges, of which, however, only the overture remains extant. In 1825 he left the Conservatoire, and began a course of self-education, founded chiefly on the works of Beethoven, Gluck, Weber and other German masters. About this period Berlioz saw for the first time the talented Irish actress Henrietta Smithson, who was then charming Paris by her impersonations of Ophelia, Juliet and other Shakespearean characters. The enthusiastic young composer became deeply enamored of her at first sight, and tried, for a long time in vain, to gain the love or even the attention of his idol. To an incident of this wild and persevering courtship Berlioz's first symphonic work, Épisode de la vie d'un artiste, owes its origin. By the advice of his friends Berlioz once more entered the Conservatoire, where, after several unsuccessful attempts, his cantata Sardanapalus gained him the first prize for foreign travel (1830), in spite of the strong personal antagonism of one of the umpires. During a stay in Italy Berlioz composed an overture to King Lear, and Le Retour à la vie -- a sort of symphony, with intervening poetical declamation between the single movements, called by the composer a melologue, and written in continuation of the Épisode de la vie d'un artiste, along with which work it was performed at the Paris Conservatoire in 1832. Niccolo Paganini on that occasion spoke to Berlioz the memorable words: "Vous commencez par où les autres ont fini." Miss Smithson, who also was present on the occasion, consented to become the wife of her ardent lover in 1833. The marriage was a tempestuous mistake. In 1840 he separated from his wife, who died in 1854. Six months later Berlioz married Mademoiselle Récio. His second wife did not live very long, nor was there much that was edifying in this marriage. Between the date of his first marriage and 1840 came out his dramatic symphonies Harold en Italie, Funèbre et triomphale, and Romeo et Juliette; his opera Benvenuto Cellini (1837); his Requiem, and other works. In the course of time Berlioz won his due share of the distinctions generally awarded to artistic merit, such as the ribbon of the Legion of Honor and the membership of the Institute. But these distinctions he owed, perhaps, less to a genuine admiration of his compositions than to his successes abroad and his influential position as the musical critic of the Journal des Débats (a position which he held from 1838 to 1864, and which he never used or abused to push his own works). In 1842 Berlioz went for the first time to Germany, where he was hailed with welcome by the leading musicians of the younger generation, Robert Schumann foremost amongst them. The latter paved the way for the French composer's success by a comprehensive analysis of the Épisode in his musical journal, the Neue Zeitschrift für Musik. In 1846 he produced his magnificent cantata La Damnation de Faust. Berlioz gave successful concerts at Leipzig and other German cities, and repeated his visit on various later occasions -- in 1852 by invitation of Franz Liszt, to conduct his opera, Benvenuto Cellini (hissed off the stage in Paris), at Weimar; and in 1855 to produce his oratorio-trilogy, L'Enfance du Christ, in the same city. This latter work had been previously performed at Paris, where Berlioz mystified the critics by pretending to have found the last chorus amongst the manuscript scores of a composer of the 17th century, Pierre Ducré by name. In 1855 his Te Deum was written for the opening of the Paris exhibition. 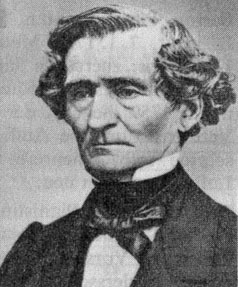 Berlioz also made journeys to Vienna (1866) and St. Petersburg (1867), where his works were received with great enthusiasm. In 1861 he produced his work Beatrice et Benedict, and in 1863 Les Troyens. He died in Paris on the 8th of March 1869. It is not only as a composer that the life of Berlioz is full of interest, although in this respect his achievement is singularly significant for the comprehension of the modern spirit in music. But it is as the symbol of French romanticism in the whole domain of aesthetic perception that his preeminence has come to be recognized. His Mémoires (begun in London in 1848 and finished in 1865) illustrate this romantic spirit at its highest elevation as well as at its lowest depths. Victor Hugo was a romantic, Alfred de Musset was a romantic, but Berlioz was romanticism itself. As a boy he is in despair over the despair of Dido, and his breath is taken away at Virgil's "Quaesivit coelo lucem ingemuitque reperta." At the age of twelve he is in love with "Estelle", whom he meets fifty years afterwards. The scene is described by himself (1865) with minute fidelity -- a scene which Gustave Flaubert must have known by heart when he wrote its parallel in the novel L'Éducation sentimentale. The romance of this meeting between the man -- old, isolated, unspeakably sad, with the halo of public fame burning round him -- and the woman -- old also, a mother, a widow, whose beauty he had worshipped when she was eighteen -- is striking. In a frame of chastened melancholy and joy at the sight of Estelle, Berlioz goes to dine with Patti and her family. Patti, on the threshold of her career, pets Berlioz with such uncontrollable affection, that as the composer wrote a description of his feelings he was overwhelmed at the bitterness of fate. What would he not have given for Estelle to show him such affection! Patti seemed to him like a marvelous bird with diamond wings flitting round his head, resting on his shoulder, plucking his hair and singing her most joyous songs to the accompaniment of beating wings. "I was enchanted but not moved. The fact is that the young, beautiful, dazzling, famous virtuoso who at the age of twenty-two has already seen musical Europe and America at her feet, does not win the power of love in me; and the aged woman, sad, obscure, ignorant of art, possesses my soul as she did in the days gone by, as she will do until my last day." If this episode touches the sublime, it may be urged with almost equal truth that his description of the exhumation of his two wives and their reburial in a single tomb touches the ridiculous. And yet the scene is described with a perception of all the detail which would call for the highest praise in a novelist. Perhaps some parallel between the splendid and the ridiculous in this singular figure may be seen in the comparison of Nadar's caricature with Charpentier's portrait of the composer. The profound admiration of Berlioz for William Shakespeare, which rose at moments to such a pitch of folly that he set Shakespeare in the place of God and worshipped him, cannot be explained simply on the ground that Henrietta Smithson was a great Shakespearean actress. Unquestionably the great figures in English literature had a profound attraction for him, and while the romantic spirit is obvious in his selections from Lord Byron and Sir Walter Scott, it can also be traced in the quality of his enthusiasm for Shakespeare. It is in his music more than in his literary attitude, however, that is disclosed something in addition to the pure romance of Schumann -- something that places him nearer in kind to Richard Wagner, who recognized in him a composer from whose works he might learn something useful for the cultivation of his own ideals. As a youth the power of Beethoven's symphonies made a deep impression on Berlioz, and what has been described as the "poetical idea" in Beethoven's creations ran riot in the young medical student's mind. He thus became one of the most ardent and enlightened originators of what is now known as "program music." Technically he was a brilliant musical colorist, often extravagant, but with the extravagant emotionalism of genius. He was a master of the orchestra; indeed, his treatment of the orchestra and his invention of unprecedented effects of timbre give him a solitary position in musical history; he had an extraordinary gift for the use of the various instruments, and himself propounded a new ideal for the force to be employed, on an enormous scale. Letter quoted by K. F. Boult, Life of Berlioz (1903), p. 298.